Ovaries in pain need special attention. Ovarian cysts are a frequent cause of pelvic pain. 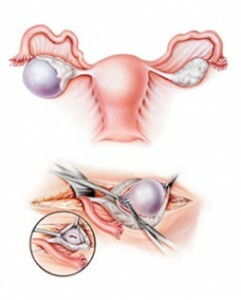 There are many types of ovarian cysts. An ovary that is ovulating (producing eggs) usually produces cysts that are small (1-2 cm ) every month. These usually resolve naturally and are of no consequence. However, other types of cysts do not resolve on their own and may need surgical attention. Ovarian cysts are best evaluated with advanced ultrasound technology. At Women’s Care, we have the highest quality ultrasounds performed by technicians who are experts in obstetrics and gynecology. These ultrasounds are performed in the comfort of our office. We strive to make the ultrasound a pleasant experience, focusing on your comfort as well as the quality of the images and readings. Simple Cysts: Can occur on the ovary and unless they are large (greater than 8 cm) or cause symptoms, are expectantly watched by ultrasound. Hemorrhagic Corpus Luteum Cysts: Can form due to a variety of circumstances. These are usually expectantly watched and typically resolve unless large or symptomatic. Dermoid Cysts: Develop from germ cells in the ovary that are primitive cells able to produce not just eggs, but all types of human tissue. If these germ cells multiply abnormally they can form a tumor that may contain hair, oily sebaceous material, bone, neural tissue and teeth. These may be removed depending on the circumstance. Endometriosis Cysts: Endometriosis is a condition where the lining cells of the uterus are located outside of the uterus in other places within the pelvis. Endometriosis can also be a component of an ovarian cyst. Usually this cyst has noticeably dark fluid. Management of the cyst depends on its appearance and your symptoms. Complex Cysts: Include a variety of disorders involving the ovary, and can be evaluated with ultrasounds and blood work evaluating for tumor markers. The management of these cysts depends on the ultrasound findings, symptoms and lab results. Certain ovarian cysts may be cancerous. Please inform your Women’s Care Doctor if you have chronic bloating or abdominal pain, or widening of the abdomen. These symptoms can be evaluated by ultrasound or surgery. Please let your doctor know if you have relatives in your family who have had ovarian cancer. Sometimes genetic counseling can be useful.